Eager to make sight words easier to grasp? Your preschooler will get a kick out of this fun sight word activity. Help your child by cutting out the small, decorative squares on the second page, and then watch your beginning reader get creative! Once kids decorate this important sight word, they'll have a pretty piece of art to hang up. Sprucing up and seeing the word "you" will boost their early reading skills. Looking for more printables like this? Check out the rest of the Sight WordsSeries! Spelling is a core language arts skill in the year four curriculum. 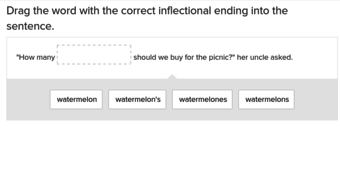 You can support kids' spelling skills with this guided lesson that features targeted instruction in common spelling patterns, as well as plenty of chances to practise. The content of this lesson was created by our team of teachers and curriculum experts. 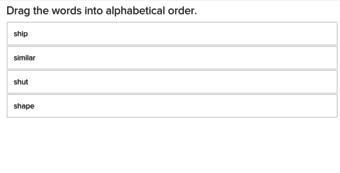 For even more spelling practise, consider downloading and printing our recommended spelling worksheets. 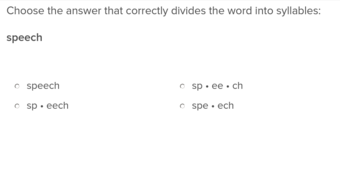 Spelling is a core language arts skill in the year four curriculum. 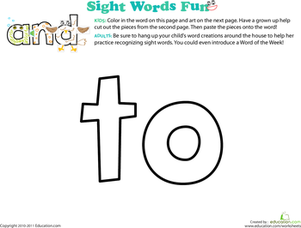 On this printable kids can colour the sight word, turn it into a crazy creature, and hang it up on their wall so they can practise reading it everyday. Help your student colour, cut, and paste his way to sight word mastery! Looking for a way to make sight words fun? Turn them into an art project! Kids learn the word "is" as they turn the word into a funny sight word creature. Help your preschooler dress up "and," a classic sight word. This makes for a cute piece of art that boosts her reading skills, too! 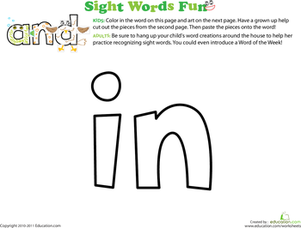 Looking to introduce some fun into learning sight words? 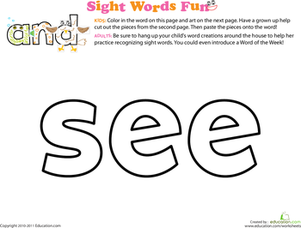 Ask your preschooler to design a sight word creature out of a classic sight word: "see." 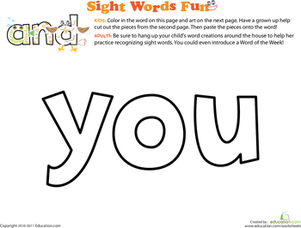 Is your child sight word savvy? 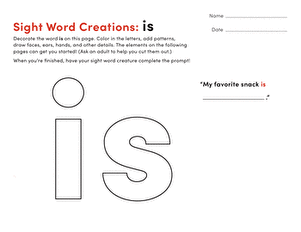 Make learning these tricky words fun with a hands-on coloring and cut and paste activity. Sight words are a little more fun when you can decorate them! 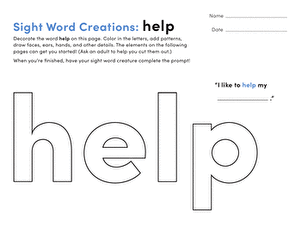 Little kids won't mind learning the word "help" with this activity-packed printable. Bring your preschooler one step closer to reading readiness with this sight word printable that explore the word "my." 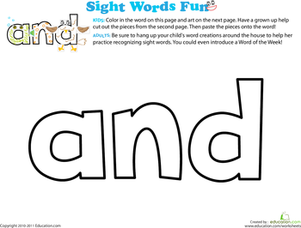 Get your preschooler started on sight words with a fun sight words art project. Kids colour the word "little" and deck it out with silly animal parts. 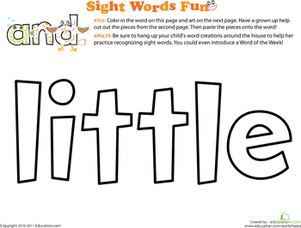 Ease your child into learning sight words with a fun arts and crafts activity. Here, kids colour the word "find" and turn it into a silly creature. 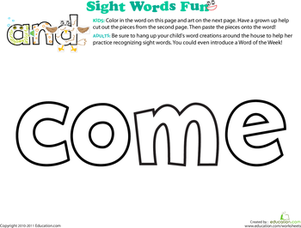 Featuring a coloring and reading activity, this cool-looking worksheet asks your preschooler to decorate an important sight word: to. 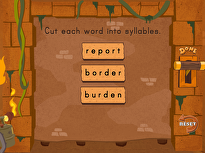 Is your child bored with sight words? 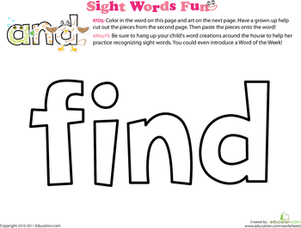 Don't let him give up on them yet--packed with kid-approved activities, this printable makes learning sight words fun.